How's that title--I can just see the attitude. Today we finished up our formal circle exploration. To begin we made our circles; small, medium, and large in the air. Lots of fun noises while we made these. We sang our song then explored the room for more circles. One little boy went to the Lego table and pointed out all the circles there. It never occurred to me that that table was full of circles. Good job. We then went to the tables. I had a ball of play dough for each child. First we squeezed the dough to make it soft. Then we rolled it into a ball. 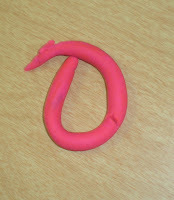 Finally we made some snakes. 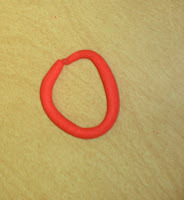 Many children had difficulty with this. After we all had a snake, we made some circles. Lots of circles, lots of "shapes" and sizes. 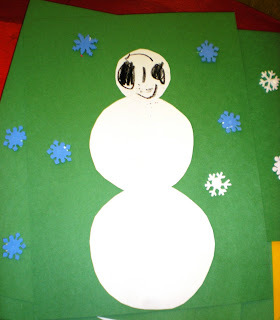 For the last circle page of our book we made a snowman. 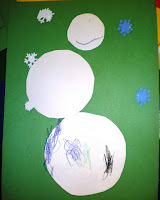 I gave each child three different sized circles and some glue and had them glue the circles to make a snowman. 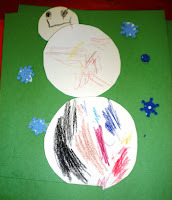 We added some finishing touches with snowflakes and crayon. They're pretty cute.